Customer communications management (CCM) is described as an advanced derivative of enterprise content management (ECM) technology. The customer communication management software is developed from the convergence of output management technologies and document composition & generation. A CCM software allows customer interactions through a wide range of communication channels such as email, mobile, web-pages, SMS, print and customer self-services. Customer communications management system automates and simplifies document-related business procedures in order to increase the business performance and efficiency. The rising adoption of CCM solutions by enterprises in the U.S. is a chief driver of the CCM market. As the CCM software enables organizations to manage communications across all distribution channels more efficiently, they are able to connect with their clients easily and forge more profitable relationships with customers. At present, the CCM market is expanding at a high rate due to new technological developments in the field of customer relationship management across the industries. In addition, the market is gaining from the increasing emphasis on context-rich information, multifarious communication channels, and multi-channel output. By the end of 2016, the U.S. customer communication management market was worth an estimated US$423.1 mn. Exhibiting a CAGR of 11% between 2017 and 2025, the market is forecast to reach US$1.06 bn by the end of 2025. Considering the various kinds of solution currently available, the U.S. CCM market can be segmented into managed CCM services, software suite, and others constituting integration & maintenance and consulting. Of these, the dominant share of 46.9% of the market was held by software suite. In the coming years, the segment is likely to show moderate growth but losing some market share. Nevertheless, the software suite segment will continue leading the market through the course of the forecast period. The growing number of enterprises across the country and rising demand for cloud-based technologies are the key drivers for the segment. Based on the enterprise size, the U.S. customer communication management market is bifurcated into into large enterprises and small & medium enterprise (SMEs). Of these, large enterprises emerged dominant in 2016. On the basis of deployment model, the U.S. CCM market is segmented into cloud and on-premise. Of these, the cloud-based segment led the market in 2016 and is expected to continue as the dominant segment through the forecast period. Proliferation of cloud-based technologies across the U.S. will support this segment’s expansion. Furthermore, in terms of end-use industry, the market is classified into healthcare, BFSI, IT & telecom, e-commerce & retail, hospitality & travel, government & utilities and others such as education, entertainment and media. Among these industries, BFSI and healthcare segments are estimated to showcase increasing demand for customer communication management in the forecast period. However, over the course of the forecast period, the IT & Telecom segment is forecast to remain dominant. The rising proliferation of IT solutions across enterprises in the U.S., and the increasing demand for innovative communication technologies will fuel the uptake of customer communication management solutions across the U.S. IT sector. This will in turn give impetus to the customer communication management market in the U.S. 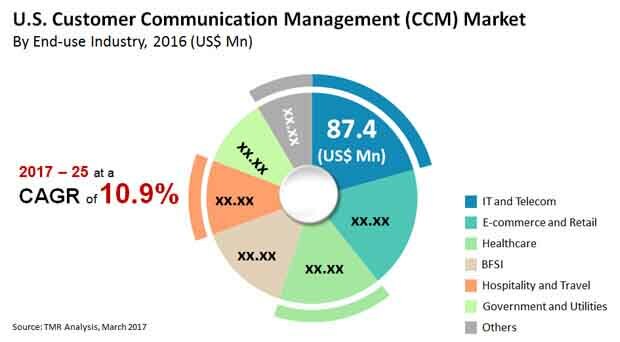 The Customer Communication Management market report provides an in-depth analysis of the U.S. customer communication management market for the period 2015 – 2025, wherein 2016 is the base year and the years from 2017 to 2025 is the forecast period. Data for 2015 has been included as historical information. The report covers all the prevalent trends playing a major role in the growth of the customer communication management market over the forecast period. It also highlights various drivers, restraints, and opportunities expected to influence the market’s growth during the forecast period. The study provides a holistic perspective on market growth in terms of revenue estimates (in US$ Mn), across the U.S. The report provides analysis of the U.S. customer communication management market in terms of market estimates and projections for all the segments across the U.S. The report also covers profiles of major players, their growth strategies, their market positioning, and the various recent developments, and includes market positioning analysis of key players operating in the customer communication management market. The market overview section of the report showcases the market dynamics and trends such as the drivers, restraints, and opportunities that influence the current nature and future status of this market. In addition, the report also provides revenue model analysis of the customer communication management market across the U.S. Customer communications management system automates and simplifies document-related business procedures to increase business performance and efficiency. The U.S. customer communication management market is experiencing growth owing to factors such as growing emphasis on multifarious and divergent communication channels and growing adoption of CCM solutions by enterprises to enhance their customer base across the country. The customer communication management market data estimates are the result of our in-depth secondary research, primary interviews and in-house expert panel reviews. These market estimates have been analyzed by taking into account the impact of different political, social, economic, technological, and legal factors along with the current market dynamics affecting the market growth. The research study on the U.S. customer communication management market provides a detailed analysis of various solution types of customer communication management systems available in the market. Based on the solution type, the market is further divided into the software suite, managed CCM services, and others services including consulting, integration, and maintenance. Based on the enterprise size, the U.S. customer communication management market is categorized into large enterprises, and small & medium enterprises (SMEs). On the basis of deployment model, the market is segmented into cloud-based and on premise. Furthermore, the end-use industry based segmentation includes healthcare, banking financial services & insurance (BFSI), IT & telecom, e-commerce & retail, hospitality & travel, government & utilities, and others such as education, and entertainment & media. The report includes a comprehensive analysis of all segments under the market attractiveness analysis section. The report also includes competitive profiling of the key players associated with the U.S. customer communication management market. The important business strategies adopted by them, their market positioning, financials, SWOT analysis, and recent developments have also been identified in the research report. The competitive landscape section of the report also gives an overview about the major contributing regions/countries by these key players in order to strengthen their market position in the future. The report also provides market share analysis of the U.S. customer communication management market. Adobe systems, Inc., Cincom Systems, Inc., Doxee S.p.A., Emc Corporation (Dell), HP enterprise, Newgen Software, OpenText Corp., Oracle Corporation, Pitney Bowes, Inc., and Xerox Corporation, are the key players which have been profiled in this study. Details such as financials, business strategies, SWOT analysis, recent developments, and other such strategic information pertaining to these players has been duly provided as part of company profiling.